Surrounded by yellow Hezbollah flags, more than 60 Iranian volunteers set off Wednesday to join what they called a holy war against Israeli forces in Lebanon. The group — ranging from teenagers to grandfathers — plans to join about 200 other volunteers on the way to the Turkish border, which they hope to cross Thursday. They plan to reach Lebanon via Syria over the weekend. Iran says it will not send regular forces to aid Hezbollah, but apparently it will not attempt to stop volunteer guerrillas. Iran and Syria are Hezbollah's main sponsors. Organizers said the volunteers were not carrying weapons, and it was not clear whether Turkey would let them pass. A Turkish Foreign Ministry official, speaking on condition of anonymity, would not say Wednesday if they would be allowed to cross. Iranians, however, can enter Turkey without a visa and stay for three months. "We are just the first wave of Islamic warriors from Iran," said Amir Jalilinejad, chairman of the Student Justice Movement, a nongovernmental group that helped recruit the fighters. "More will come from here and other Muslim nations around the world. Hezbollah needs our help." Military service is mandatory in Iran and nearly every man has at least some basic training. Some hard-liners have more extensive drills as members of the Basiji corps, a paramilitary network linked to the powerful Revolutionary Guard. Other volunteers, such as 72-year-old Hasan Honavi, have combat experience from the 1980-88 war with Iraq. "God made this decision for me," said Honavi, a grandfather and one of the oldest volunteers. "I still have fight left in me for a holy war." The group, chanting and marching in military-style formation, assembled Wednesday in a part of Tehran's main cemetery that is reserved for war dead and other "martyrs." They prayed on Persian carpets and linked hands, with their shoes and bags piled alongside. Few had any battle-type gear, and some arrived in dress shoes or plastic sandals. Some bowed before a memorial to Hezbollah-linked suicide bombers who carried out the 1983 blast at Marine barracks in Beirut that killed 241 U.S. servicemen. An almost simultaneous bombing killed 56 French peacekeepers. Speakers praised Hezbollah leader Sheik Hassan Nasrallah and laid scorn on Muslim leaders — including their own government — for not sending battlefield assistance to Hezbollah since the fighting erupted two weeks ago. Even if the volunteers fail to reach Lebanon, their mobilization is an example of how Iranians are rallying to Hezbollah through organizations outside official circles. In Iraq, dozens of volunteers helped enlist Iraqis willing to fight along Hezbollah guerillas in Lebanon at a Shiite party headquarters in the southern city of Basra. The party's Secretary General Yousif al Mousawi said about 200 people signed up within two hours on Wednesday night. Iran insists it is not directly involved in the conflict on the military side, but it remains the group's key pipeline for funds. Iran has dismissed Israel's claims that Hezbollah has been supplied with upgraded Iranian missiles that have reached Haifa and other points across northern Israel. 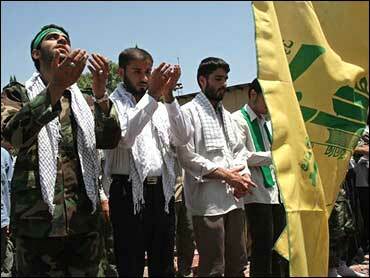 "We cannot stand by and watch out Hezbollah brothers fight alone," said Komeil Baradaran, a 21-year-old Basiji member. "If we are to die in Lebanon, then we will go to heaven. It is our duty as Muslims to fight"